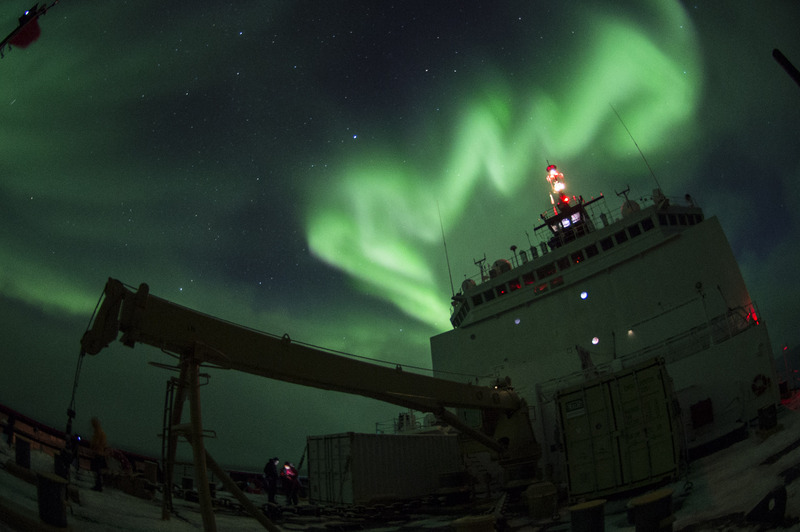 Aurora Borealis from the USCGC Healy in the Arctic Ocean. U.S. Coast Guard photo by Petty Officer 2nd Class Cory J. Mendenhall. At night the skies have been alive with dancing green light and shooting stars. The Aurora Borealis occurs when electrically charged particles from the sun (solar wind) interact with gases in Earth’s atmosphere. Solar wind is deflected by Earth’s magnetic field over most of the planet, but the magnetic field is weaker at the north and south poles allowing some particles to enter the atmosphere. We have seen mostly green auroras that are created when solar wind interacts with oxygen within 60 miles of Earth’s surface, there have also been some hints of red light from the interaction with oxygen at higher altitudes. Blue and purple colors can occur when solar wind interacts with nitrogen. All night you will find people on various decks of the ship with their heads up to the sky or faces pressed against the glass windows of the bridge which is kept dark to navigate at night. The U.S. National Oceanic and Atmospheric Administration uses satellite data and computer models to predict the location and visibility of the aurora everyday, we have been seeing a 4 out of 10 on the visibility scale and even that is spectacular. The most abundant elements in seawater are salt ions (sodium, chloride, sulfate, magnesium, calcium, etc. ), and on average one liter of seawater contains 35 grams of dissolved salt (one liter of seawater weighs roughly 1000 grams so salinity is measured as parts per thousand). The GEOTRACES program specializes in measuring the least abundant elements in the ocean, referred to as “trace-elements.” Concentrations of the trace-element mercury, for example, are often less than 0.000 000 000 200 grams dissolved in one liter of seawater (parts per trillion). From this perspective, finding a needle in a haystack sounds easier than searching for mercury in the ocean. Because these elements are found at such low concentrations, even a small amount of contamination can significantly alter a sample. 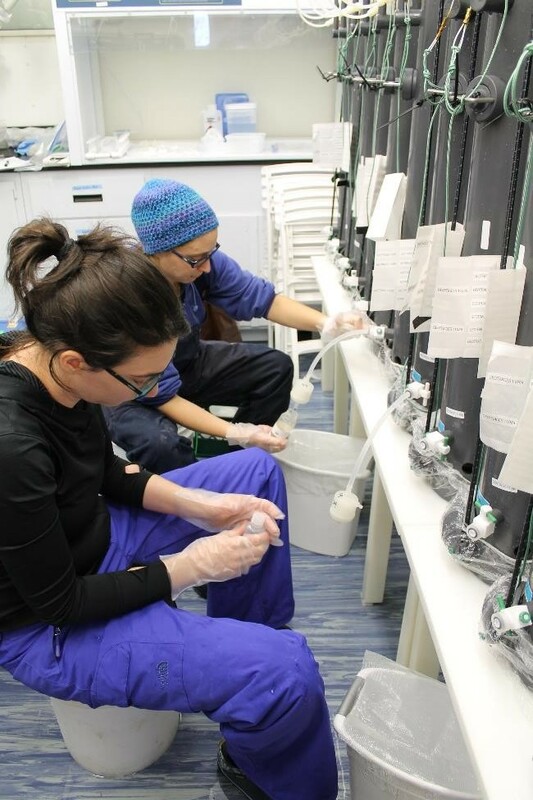 Collecting contamination-free samples is a delicate process – imagine the challenges that arise when looking for trace amounts of iron in seawater collected from a giant rusty ship! The GEOTRACES program has developed specific sampling protocols that include a number of inventive solutions such as plastic shower caps, Kevlar line, and hand carrying 4 ft long GoFlo bottles. The photos below outline the procedure for collecting contamination-free vertical profiles of seawater from the ocean surface to the ocean floor. Outside of the ice pack surface water is collected from a small boat with acid-cleaned plastic tubing and a peristaltic pump. Away from the ship, the small boat slowly moves forward as surface water is pumped into a large carboy. Only water deeper than 20 meters is collected from the ship to avoid contamination from the Healy’s metal hull. Full depth profiles are collected in specially designed GoFlo bottles. The bottles are long cylinders with openings at both ends and are lined with high quality plastic (Teflon) that can withstand acid-washing to remove contaminants. In this image the GoFlo bottles are attached a plastic-coated rosette for deployment off the aft deck. Top and bottom openings of each GoFlo bottle are covered with shower caps to prevent exposure to air contaminants; shower caps remain in place while the rosette is on deck and are removed immediately before deployment. 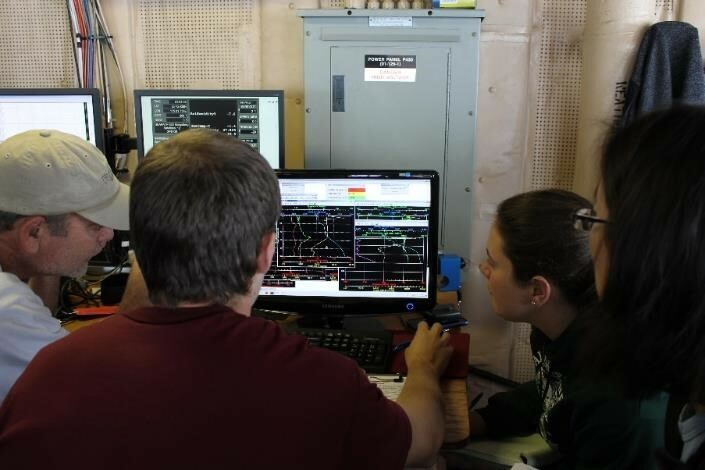 The center of this console is equipped with CTD sensors to measure pressure, conductivity, and temperature. The rosette is suspended from a non-metal conducting cable (dissected version shown above). 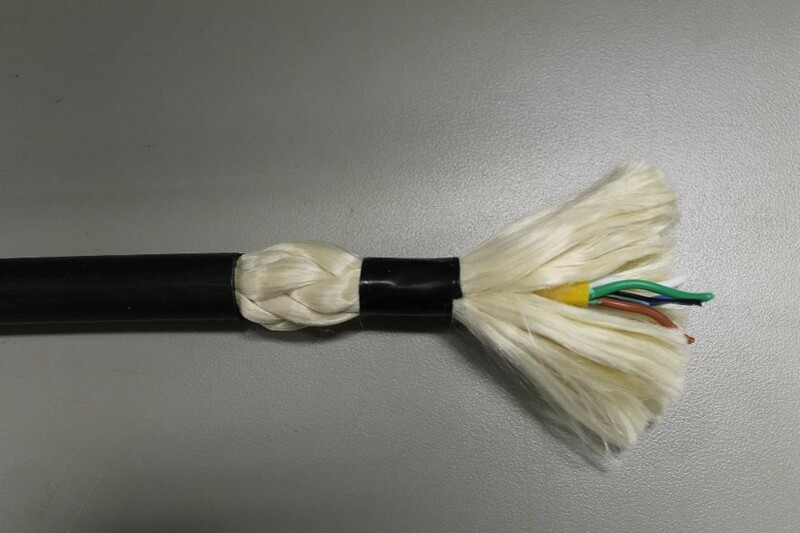 Internal wires allow transmission of data from the CTD to a computer onboard the ship, the white material is braided Kevlar that gives the cable strength, and the outer coating is polyester that creates a water-tight seal. Inside the ship scientists watch a live feed from the CTD sensors which unveils the hydrography of the water column as the rosette descends to the bottom of the ocean. Using this information, the group selects water sampling depths to capture specific features such low salinity values that may indicate the presence of a specific water mass or maximum chlorophyll values where the most algae should be found. As the rosette ascends to the surface, the GoFlo bottles are electronically triggered to close, capturing up to 24 different depths in one cast. On deck each GoFlo bottle is detached from the rosette and carried by hand into a specially designed van that serves as a clean laboratory. HEPA filters push particle free-air into the van creating positive pressure that eliminates dust penetration and deck shoes are left outside to minimize contamination sources. Inside the van each seawater sample is identified by a 5 digit code and filtered into pre-cleaned sample bottles. Some bottles are delivered to onboard laboratories where the samples are processed immediately, other bottles are preserved with acid and frozen for analysis months later back in onshore labs across the United States. Photo taken from the bridge of the Healy, strong winds blowing sea spray up to the fifth deck of the ship. This morning the decision was made to abandon the U.S. – Canadian GEOTRACES cross-over station due to rough weather. The cross-over station was designed to compare results with Canadian researchers who occupied the same location in mid-September to ensure the accuracy of our measurements within the international oceanographic community. Over the past two days we have been on stand-by waiting for the winds to subside below 20 knots in order to safely deploy our equipment. 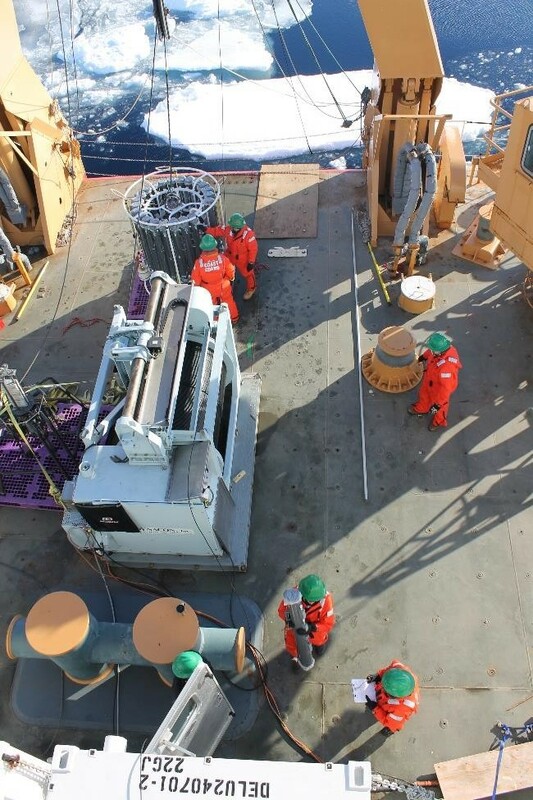 We were able to complete some rosette casts to sample radioisotopes, however, attempts to collect water and particles for trace-metal analysis were abandoned as cable lines frayed under pressure from strong surface currents. Rough weather is predicted to stick around this location for days so we are heading south towards our finals stations, and calmer seas. 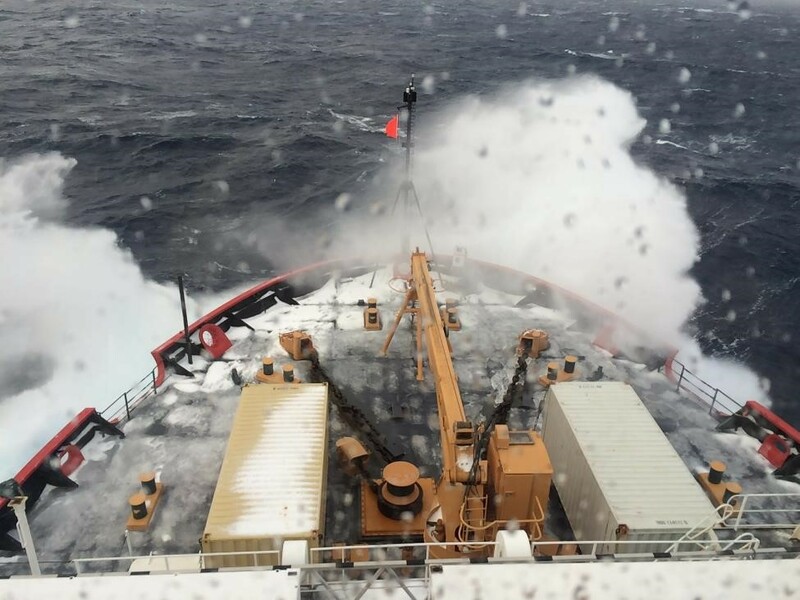 The Canadian GEOTRACES team also encountered rough seas at this station but the weather cleared long enough to complete their work. The Canadian team’s sampling wire also suffered some minor damage, but it wasn’t from the weather. A curious polar bear and her two cubs were caught gnawing on the ship’s wire, luckily the bears lost interest before any serious damage was done (check out this link for the full story). Perhaps this cross-over station just wasn’t meant to be. One, two, three, sumo! 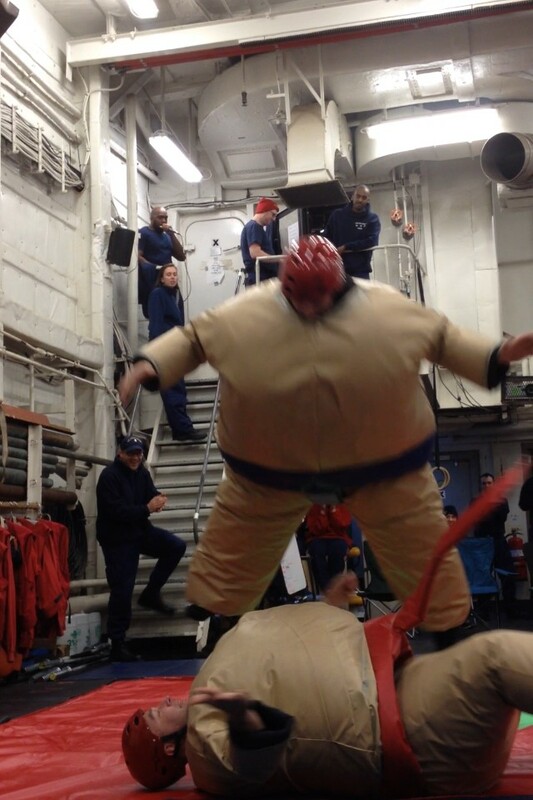 Every Saturday night onboard the USCGC Healy scientists and crew members come together for morale boosting events such as sumo night, a talent show, and karaoke. 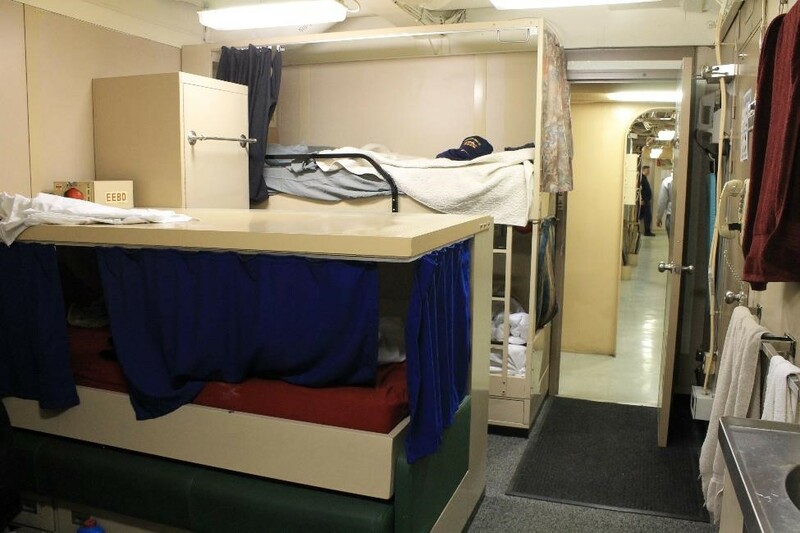 Today is day 51 at sea onboard the Healy, I can’t remember the last time I blow dried my hair or put on make-up, I have mastered the quick water conserving “sea shower,” and can rise to my top bunk in just two quick steps. Life at sea is a lot like middle school summer camp and it’s not just the bunk beds and cafeteria style dining – it’s living with a collection of characters, working together, and learning to rely on each other. Onboard the Healy are 51 scientists ranging in age from mid-20s to mid-60s with experience levels from graduate students to senior scientists. There are 93 Coast Guard crew members ranking from entry level seamen as young as 18, to officers, commanders, and of course the captain. 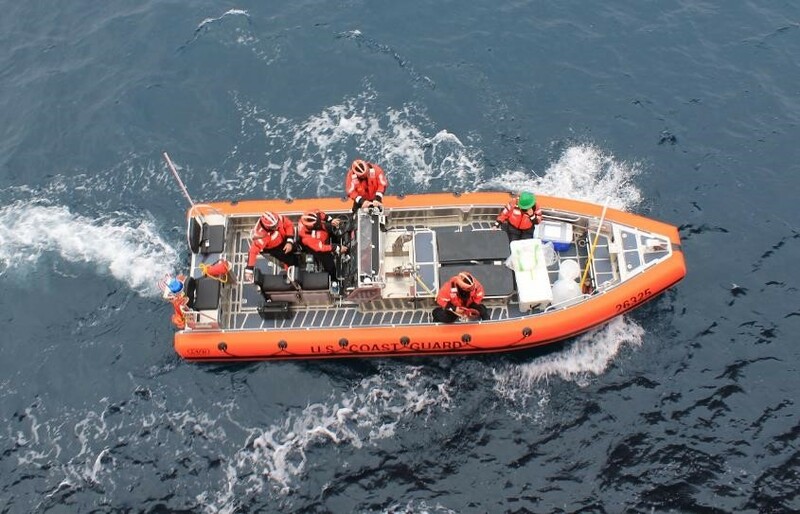 Coast Guard members are assigned to the Healy for three years and work on the ship year-round whether in port or at sea. Gender balance within the science party is fairly even with 43% female, but women make up only 25% of the Coast Guard crew. This expedition is a once in a lifetime opportunity that took years to plan and millions of dollars to implement. To take full advantage of our precious time in the Arctic the schedule is tight – oftentimes we arrive at a new station just as work from the previous station is commencing. There is no such thing as an 8-5 workday on a research cruise, days often blur together and it becomes difficult to tell if the sleepy person munching on a bagel at dinner has been working for hours or is just getting up at 6PM for breakfast. Between stations our message board reads, “Sleep now, and as much as you can!,” a reminder of the long hours that lie ahead. State rooms onboard the Healy. The “coffin” is in the foreground and bunk beds are in the background. Each room also has a sink and vanity. Cafeteria style galley where four meals are served every day. 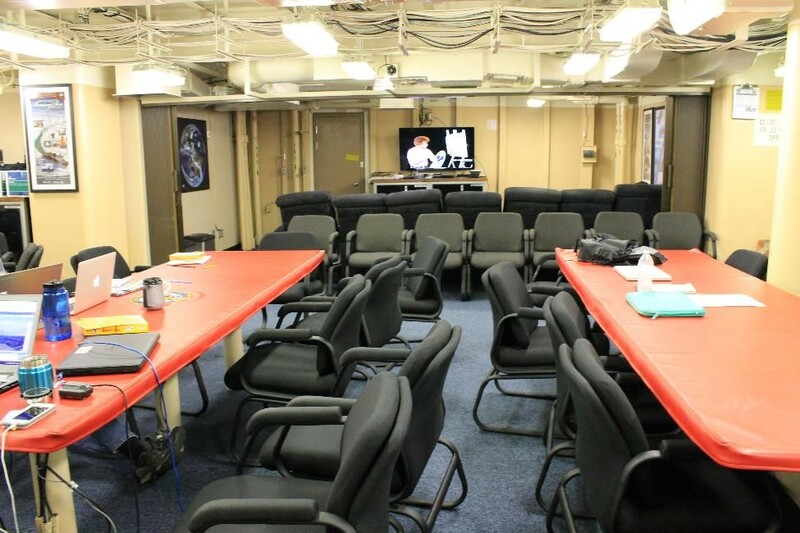 The Science Lounge serves as a living and work area for scientists. 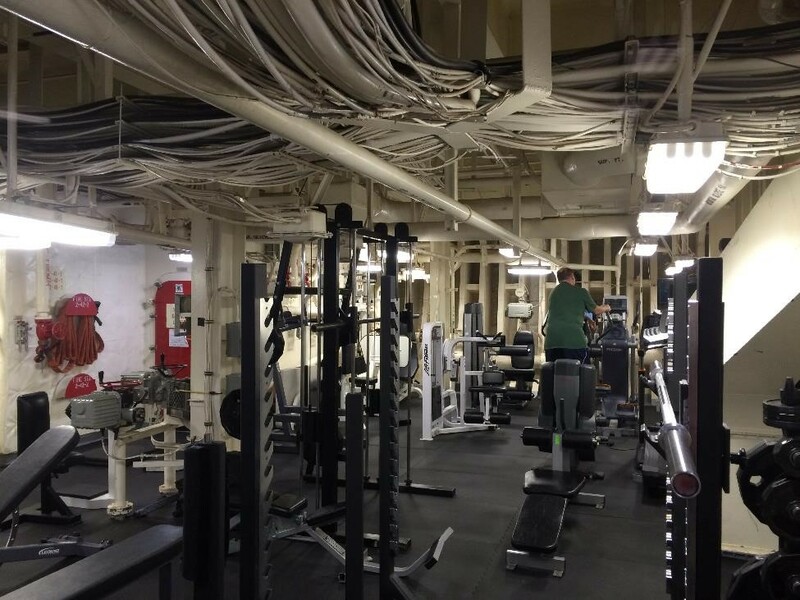 One of two workout facilities onboard. Walking from living quarters to the main lab requires passage through 5 water tight doors. 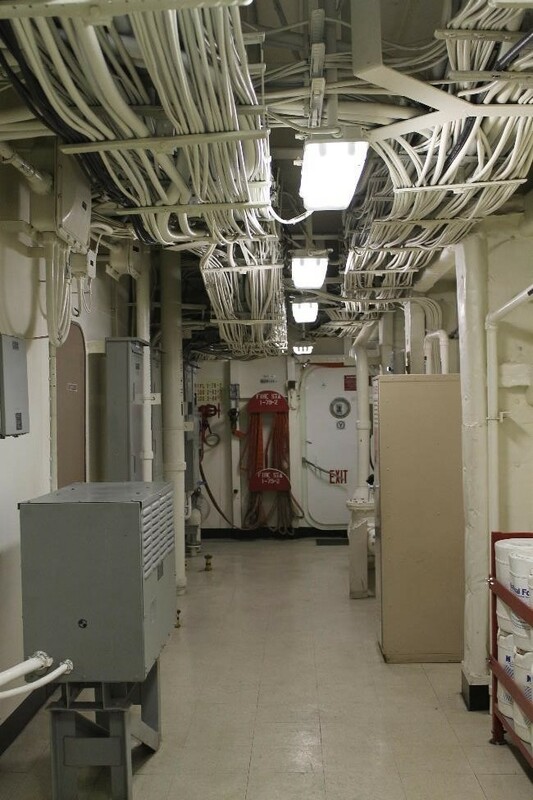 The ship is compartmentalized by these doors to stop the spread of smoke, fire, or water in an emergency. The U.S. GEOTRACES team is three weeks into the return leg of our expedition, moving south towards Dutch Harbor, Alaska. During the month of September we have witnessed the transition from Arctic summer to fall; behind us are large floes of multi-year ice and 24 hours of sunlight, ahead lies open water, thin ice, and dark nights. 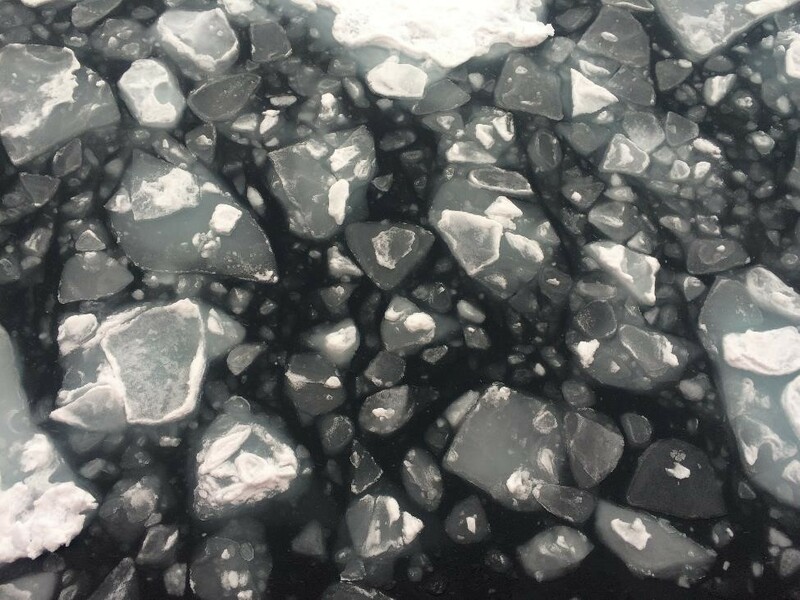 In August we passed through the marginal ice zone where large sheets of ice had melted leaving behind open water. Today we re-entered the marginal ice zone but in a different season, the open water left behind from summer melting is now re-freezing and many of the open leads we are sailing through will be completely frozen by March. Living conditions outside the cozy confines of our ship are harsh at best, but amazingly we’ve had a number of wildlife encounters over the past two weeks. Curiosity (and perhaps hunger) drove a brave young polar bear within 100 yards of the ship, he stuck around long enough for a quick picture before something scared him off. Later an Arctic fox was spotted, these animals are known to follow in the footsteps of polar bears to feed on leftover food scraps. GoPro cameras lowered beneath the ice during sampling have caught glimpses of small fish, large clusters of algae, and even a ringed seal. 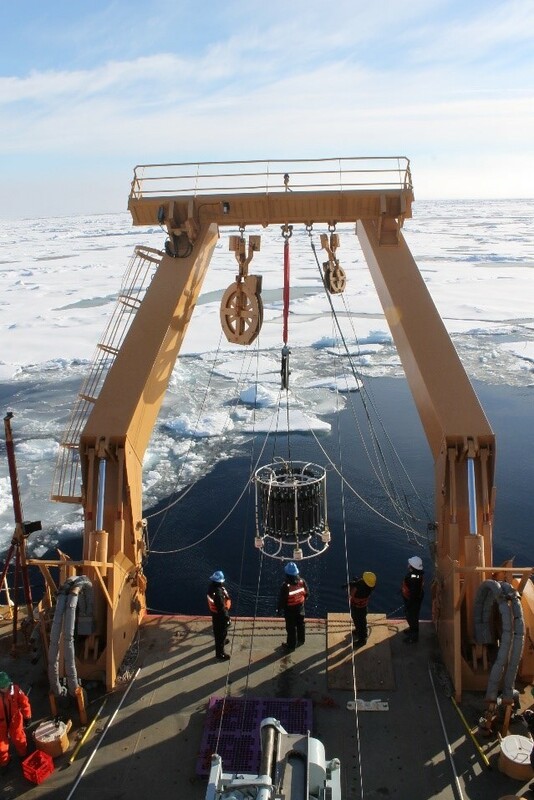 Onboard melted ice cores have revealed a colorful variety of macro- and microscopic phytoplankton and DNA samples are being collected to map out the biology of life in the ice. Inside the ship, living conditions threatened to turn harsh as one of our two evaporators used to generate freshwater went down. 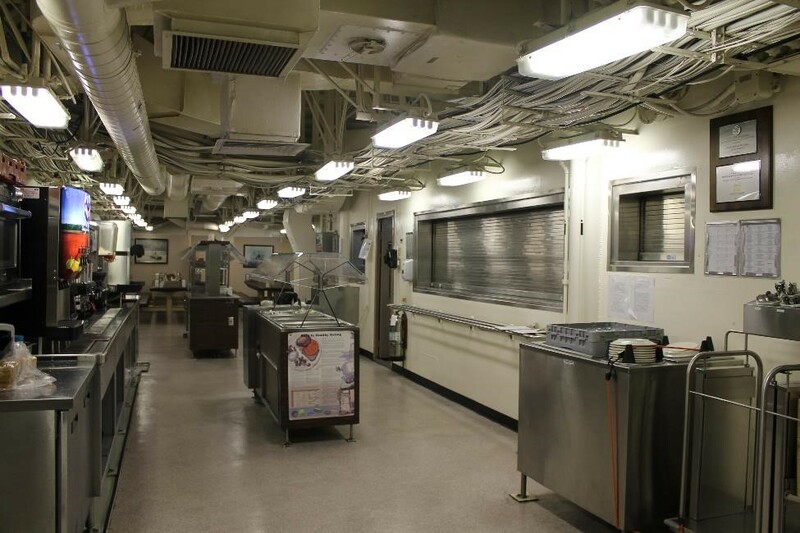 Restrictions were enforced as the ship’s water making capacity dropped to 45% – that means no laundry, paper plates and plastic utensils in the galley to minimize dishes, and “sea showers” (30 seconds to get wet, water off to soap up, 60 seconds of water to rinse). Luckily the restrictions were lifted after one week and the problem has since been resolved. It looks like we’ll show up in Dutch Harbor showered and wearing clean clothes for our final port stop on October 12th. 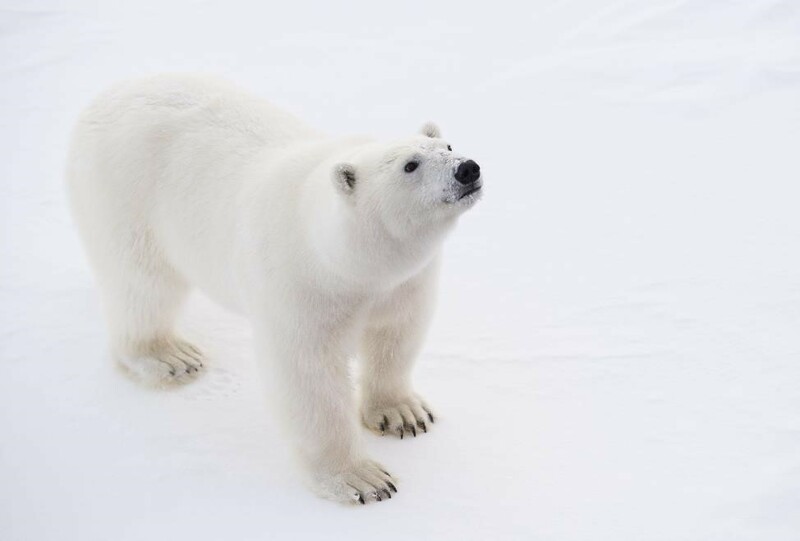 A young polar bear approached the USCGC Healy as we stopped for a water sampling station (Photo by Croy Carlin, Oregon State University). Old ice – Above 80 °N we encountered thick floes of “multi-year ice,” large sheets that persist through the summer melting season and continue to grow in the winter. New ice – Below 80 °N surface water is beginning to re-freeze as winter approaches. When surface water freezes wave motion causes round pieces of “pancake ice” to form rather than one large solid sheet. Pancake ice will eventually freeze together to form large ice sheets that continue to grow from the bottom as underlying water freezes. A view of the USCGC Healy from the ice. The U.S. GEOTRACES program sampled their first ice station on September 7, 2015 near the North Pole. As I stepped onto the ice with feet wrapped in wool socks and insulated boots, my friend Pete pointed to the ground and said “There’s two miles of ocean below us right now.” The 2 meter thick ice sheet was covered with a fresh layer of snow and felt like terra firma rather than a fluid surface. 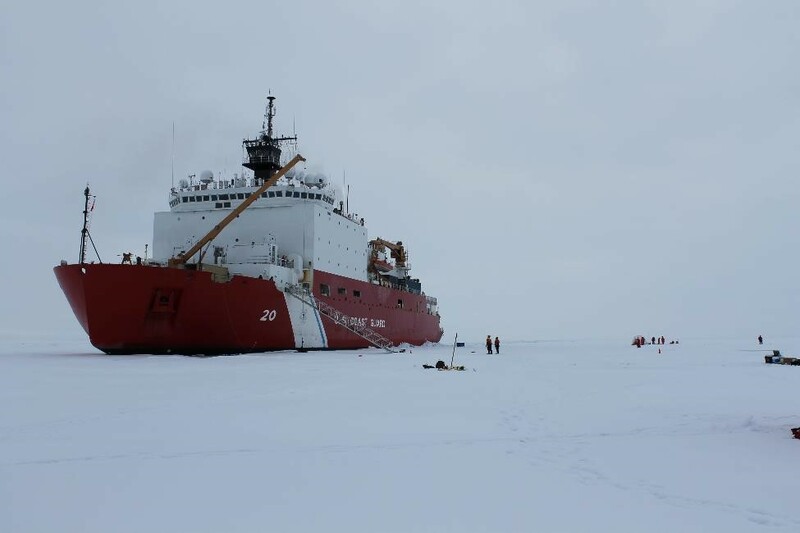 After weeks of searching, the USCGC Healy has finally encountered ice floes large enough to safely occupy. Our goal was to sample 10 ice stations, however, as of September 15 we have only completed 4 and our chances of sampling more will decrease in the coming weeks as we move south towards open water. The ice we have encountered is surprisingly thin, pocketed with open leads and first-year ice rather than the solid multi-year ice we had anticipated. It’s likely that wind and surface currents pushed thick multi-year ice towards the eastern side of the basin beyond the extent of our cruise transect. However, thin ice in the western Arctic could also be a sign of decreasing ice cover. Ice extent in the Arctic has been decreasing by an average rate of 11% per decade since observations began in 1979; this winter the lowest ice extent in history was measured by satellite imagery just five months before our expedition began. Scientists predict that summers in the Arctic Ocean will be ice-free by 2080. Complete loss of ice in the Arctic Ocean each summer will significantly change the habitat of many marine mammals and potentially alter major geochemical cycles in the basin, including the cycling of toxic metals like mercury. Many trace elements and nutrients enter the ocean from the atmosphere as rain, dust or snow, and gases like elemental mercury and carbon dioxide cycle through the air-sea interface. Sea ice can alter the chemistry of elements deposited from the atmosphere and temporarily shut down or slow gas exchange. The ice is also alive – when seawater freezes salt is expelled and brine collects in channels favored by bacteria. Sunlight can penetrate through the ice and support algal growth, especially at the bottom of the ice where light is supplemented by nutrients in the underlying water. 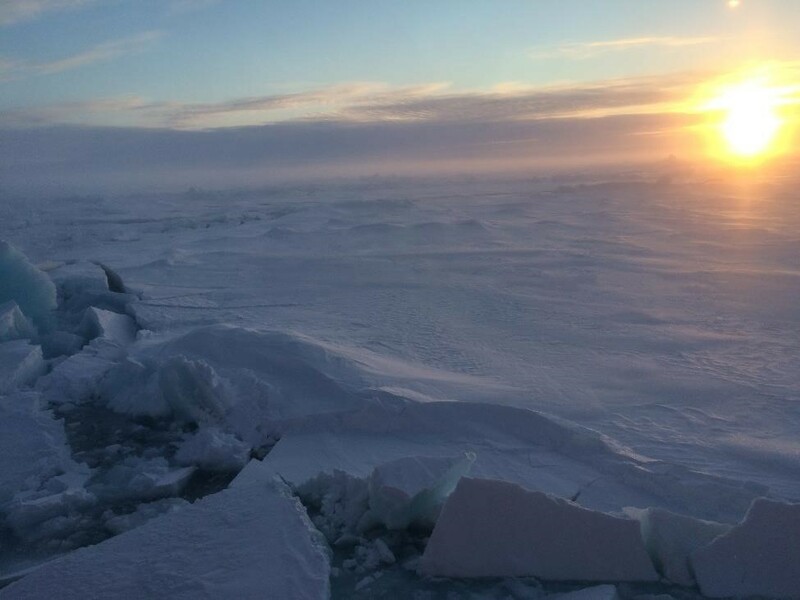 Sea ice plays an important role in chemical and biological cycles of the Arctic Ocean and we are studying these interactions to better understand how the basin may react to decreasing ice extent in the future. At each ice station a steep metal brow is lowered from the ship and the crew completes a survey of the floe, outlining a safe work area with bright orange cones. At our first station the Coast Guard ran through a series of drills, jumping into the icy cold water to practice different rescue techniques. 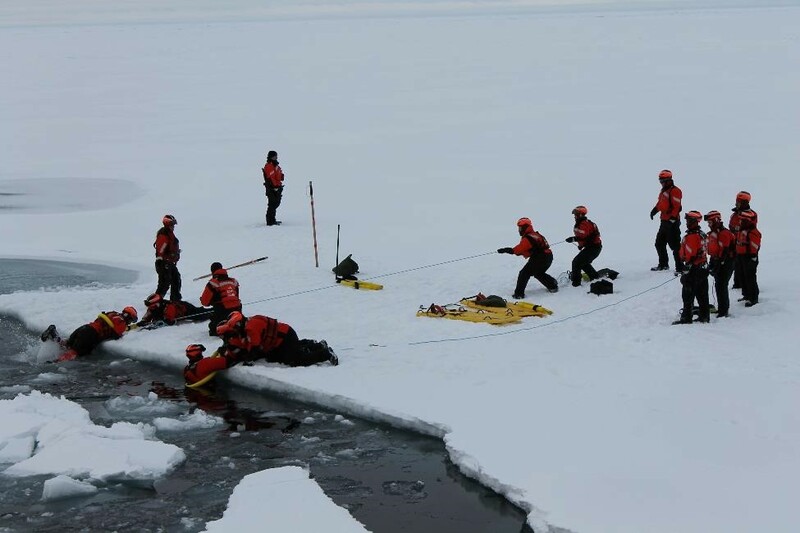 There are always at least three Coast Guard members on the ice for rescue and two with rifles for polar bear watch. Our sampling gear is craned onto the ice in large pallet boxes with two sleighs that we use to move samples across the floe. 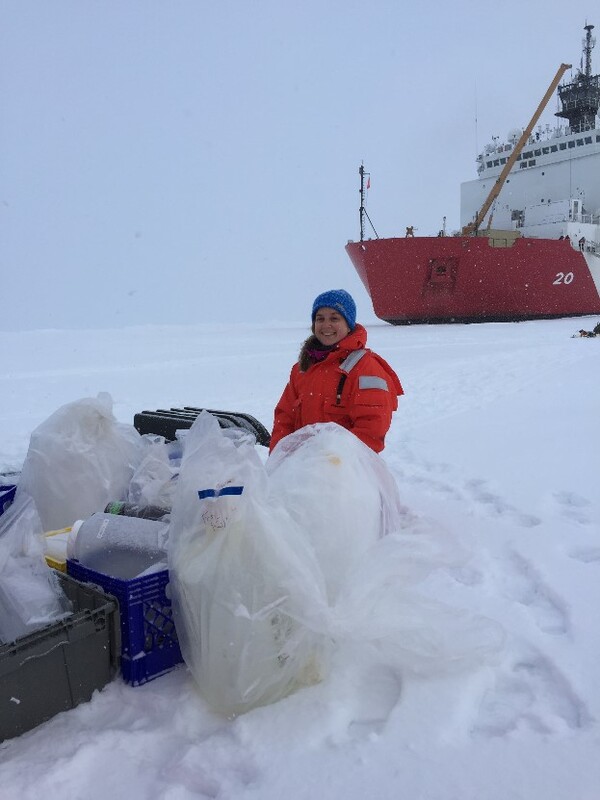 Each ice station takes about 8 hours to complete and there are multiple groups collecting samples concurrently, some scientists work in 2-3 hour shifts but many remain on the ice for the entire duration. A titanium coring device is used to collect ice for trace-element analysis. The ice cores are sealed in plastic tubes and transferred to the ship where they are sectioned in a walk-in freezer that has been modified to serve as a clean laboratory. 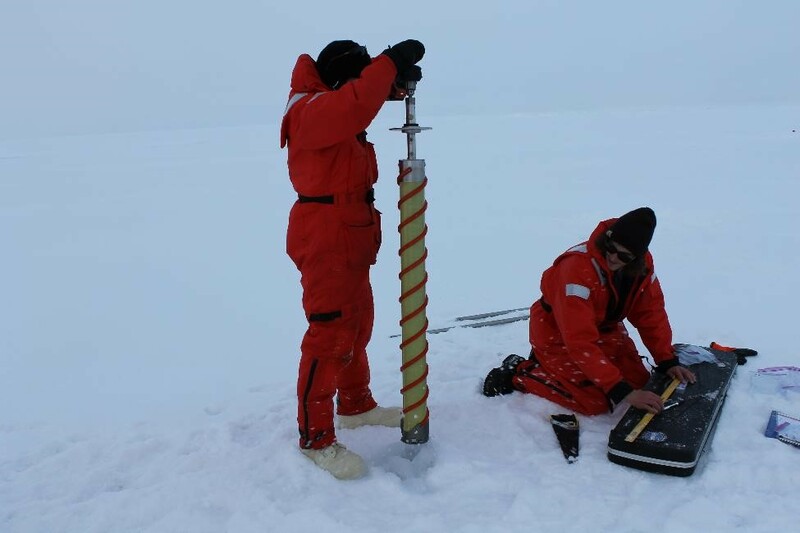 A second coring device is used to examine the physical and biological characteristics of the ice; these parameters are less prone to contamination so trace-metal clean procedures are not needed. Melt water directly below the surface and seawater as deep as 20 meters is collect through a hole drilled in the ice. Surface snow and melt pond water is collected and along with the ice cores and under-ice water will be analyzed for the same trace metals and elements measured in the water column. Dr. Anna Aguilar-Islas and Dr. Rob Rember from the University of Alaska, Fairbanks wear Tyvek suits and special gloves to collect ice cores that will be analyzed for contamination-prone metals. 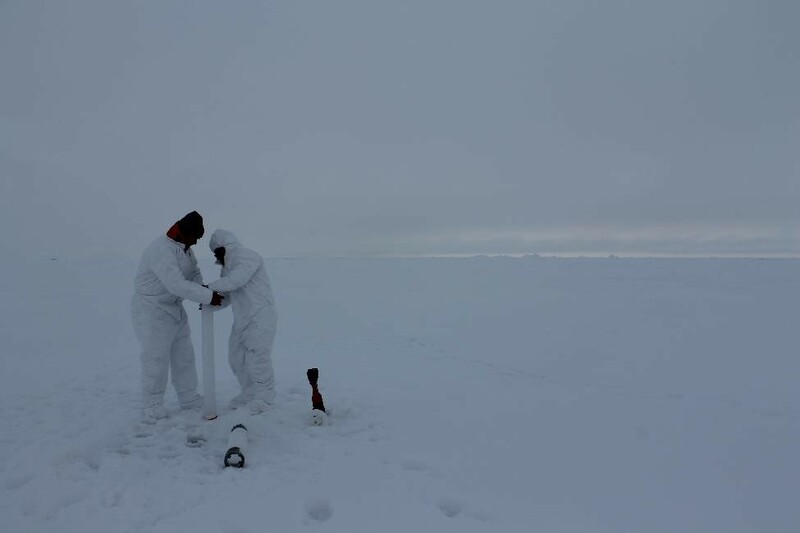 Dr. Carl Lamborg from University of California, Santa Cruz and graduate student Kyle Dilliplaine from the University of Alaska, Fairbanks collect ice cores to study physical characteristics and algae. These samples are less prone to contamination and do not require the stringent trace-metal clean techniques pictured above. Carl and Kyle are wearing insulated Mustang suits to prevent hypothermia during long exposure to cold temperatures, a required garment for working out on the ice. The U.S. Coast Guard practiced different rescue techniques before our first ice station. 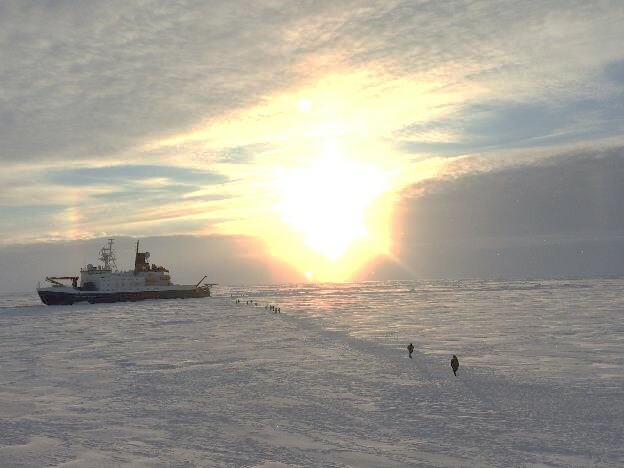 Members of the U.S. science party walk across the ice and back to the Healy after a visit to the German icebreaker Polarstern. Ninety five percent of Earth’s water lies in the ocean and on a planet dominated by saltwater, mapping the chemistry of the global ocean requires a global effort. The GEOTRACES program was established in 2006 to organize this effort, drawing support and particpation from 30 different nations. 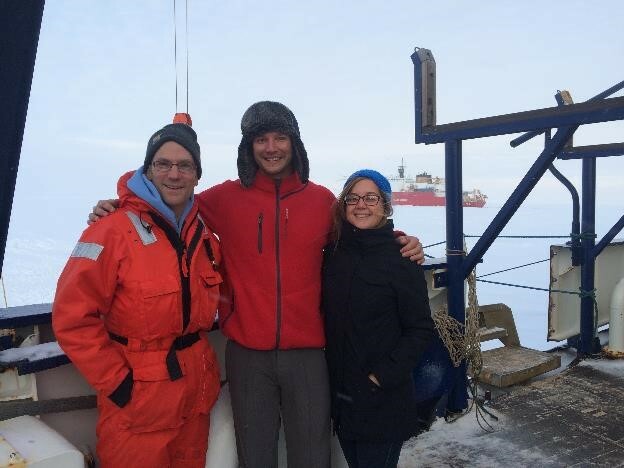 This summer research teams from the United States, Canada, and Germany are working together to survey the chemistry of the Arctic Ocean. Planning for the Arctic began five years ago and each nation’s cruise transect was designed to maximize spatial coverage of the basin while occupying international cross-over stations to assess the accuarcy of our measurments. 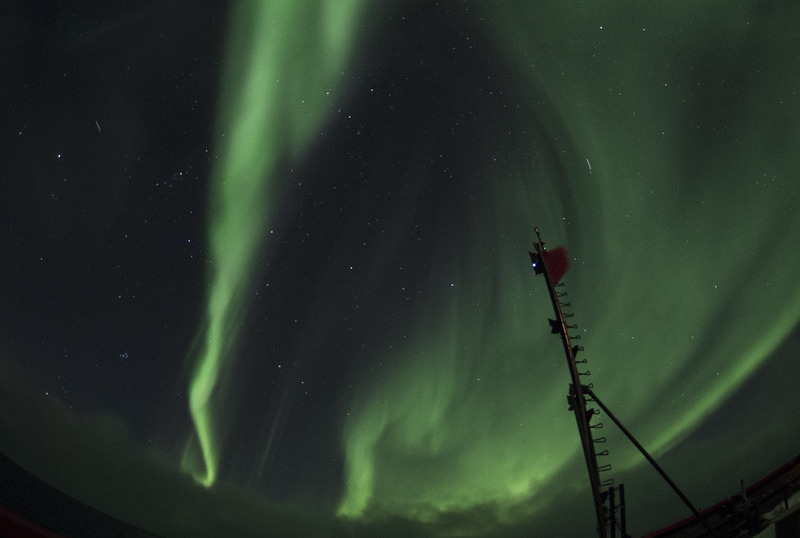 On September 7, 2015 the USCGC Healy and German R/V Polarstern crossed paths near the North Pole, an unexpected intersection in the high Arctic. On an icebreaker it is difficult to estimate the arrival time of our planned stations (speed is dictacted by ice thickness), so it was by chance that the two ships arrived near 90 °N in sync. The afternoon was spent welcoming the German science party onto the Healy, giving tours of living quarters and lab spaces. A short walk across the ice brought us to the R/V Polarstern where we were greeted with smiles and warm cider, interacting with a new set of humans for the first time in 30 days. The Polarstern has a wooden deck, a bar with a shiny disco ball suspended from the ceiling, and a swimming pool and sauna – all stark contrasts to the metal clad military vessel the U.S. science party has grown accoustomed to. I had the opportunity to visit and share data with Lars-Eric Heimburger from Bremen University, a colleague who is measuring mercury onboard the Polarstern. 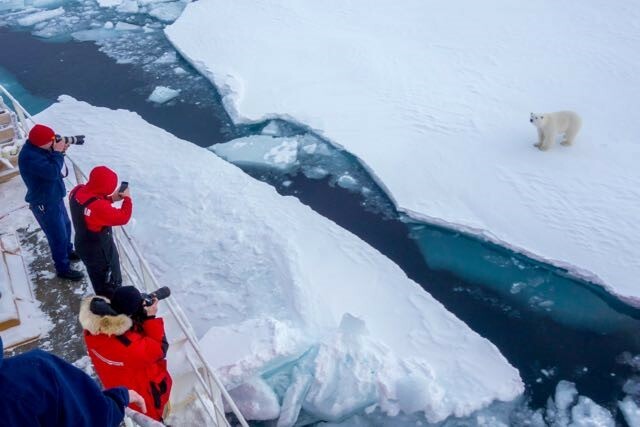 The encounter was a morale booster for science and crew members from both ships – what better place for an international meet-up than the North Pole? GEOTRACES mercury scientists on deck of the German R/V Polarstern with the USCGC Healy in the background. From left to right: Carl Lamborg (University of California, Santa Cruz), Lars-Eric Heimburger (Bremen University), Katlin Bowman (University of California, Santa Cruz), not pictured Alison Agather (Wright State University).